With such striking, rugged good looks, the VERT-X linear swing gate motor for domestic gates is more than just a pretty face. Combining an innovative open-nut drive system, advanced diagnostic capabilities and functionality, rugged die-cast aluminium construction and exceptional aesthetics for a wholly unobtrusive installation, VERT-X is positioned firmly at the apex of swing gate automation. VERT-X travels in style: using a novel open-nut drive system, VERT-X opens and closes gates smoothly, safely and reliably. Because there is no unsightly extending and retracting,VERT-X delivers unmatched conveniencewithout impacting the aesthetic appeal of your gate, and its rugged die-cast aluminium armour not only looks good, but it keeps your trusty gate swinging like it is 1938! The fully-integrated linear action operator, with no complicated linkages, makes the installation of the system very quick and easy. Added to this, the internal position control mechanism simplifies the installation even further, as the gates no longer require external end-stops…and the optional mounting templates make getting your installation dimensions just right a piece of cake! The high-torque DC motor operating through an efficient planetary gearbox, delivers a potent 250kg push force. The VERT-X is capable of reliably operating swing gates in the majority of domestic and light-industrialapplications. The revolutionary centrifugal brake developed for the V-Series operators ensures secure locking of the operator when the gate is both open and closed. The VERT-X's advanced internal limit system guarantees very reliable operation and precise control of the movement of the gate. It is designed to provide precision position information to the controller, resulting inunparalleled reliability and setting the standard in early collision detection. The VERT-X electronics, with ‘Quadra-Drive’ speed control, maintains smooth and quiet starting and stopping of the gate regardless of its condition and ambient temperatures, even after many years of service. This state-of-the-art control reduces the operating stresses and extends the life of both the operator and the gate. The mechanical gearing of the VERT-X, combined with its leading-edge speed system maintains rapid andprecisely controlled opening and closing of the gate for greater convenience and security. With only a low-voltage battery supply powering the VERT-X operator, the system is totally safe from risks such as electrocution and has the added benefit of providing power-failure protection. The added efficiency of the operator results in an exceptional number of uses in the event of a power failure. But the good news doesn’t stop there. You can enjoy complete power failure autonomy by connecting your VERT-X to a solar power supply. VERT-X is completely solar-ready and its 7Ah battery can be charged via a low-voltage supply. This makes it ideal for sites with no mains power at the gate and saves significantly on installation costs. 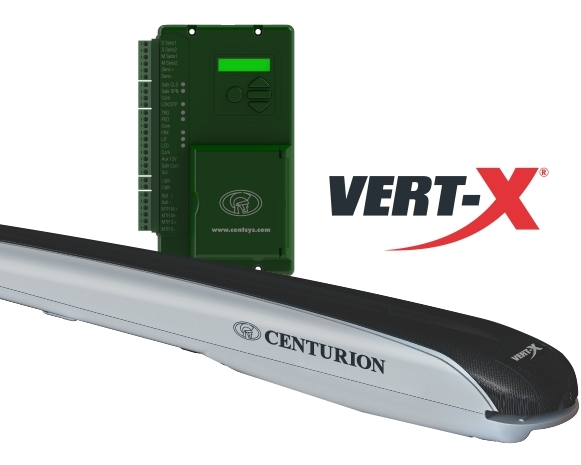 The VERT-X controller accurately monitors any obstructions to the movement of the gate and ensures ultra-safe operation, protection against crushing and end-user peace of mind. Every aspect of the VERT-X has been designed to work hard, and its anti-fatigue cable with overmoulded strain relief makes for excellent reliability and easy assembly.. The VERT-X controller, combined with its Liquid Crystal Display (LCD), provides a very intuitive and easy to use menu system for setting up the end-of-travel limits and all features available on the system. Offering an extensive range of useful features, the controller is incredibly versatile and has the ability to adapt the system to suit the requirements for almost every user.